BOSTON — Massachusetts Attorney General Maura Healey announced that the state reached settlements with seven nursing homes, including Jewish Nursing Home of Longmeadow, after an investigation found “systemic failures” at the facilities that led to the death or injury of some residents. About $500,000 in penalties were announced during a news conference Wednesday, the Boston Globe reported. The seven facilities will now be enrolled in strict compliance programs and must undergo safety and care-quality improvements. Settlements were reached with Jewish Nursing Home of Longmeadow (which received an $85,000 fine), Oxford Rehabilitation and Healthcare Center in Haverhill ($180,000), Wakefield Center in Wakefield ($30,000), the Rehabilitation and Nursing Center in Everett ($40,000), Beaumont Rehabilitation and Skilled Nursing Center in Westboro ($37,500), Braemoor Health Center in Brockton, and Woodbriar Health Center in Wilmington. Synergy Health Centers, which owns Braemoor and Woodbriar, is banned from operating in Massachusetts for seven years. Synergy will pay between $100,000 and $200,000 in fines. NORTHAMPTON — A ribbon-cutting ceremony has been scheduled for Friday, April 5 at 1 p.m. at the site of phase 3 of the Atwood Professional Campus located at 15 Atwood Dr. in Northampton. This 66,000-square-foot, Class A, three-story professional office building compliments the existing office buildings located across the street at 8 and 22 Atwood Dr., immediately off exit 18 on I-91. Both previous buildings are fully occupied, with notable tenants including Cooley Dickinson Health Care Corp., Clinical & Support Options Inc., and New England Dermatology. The new building was erected at the site of the former Clarion Inn & Conference Center and is designed to appeal to professional and medical office tenants. The owners of Northwood Development, LLC — Edward O’Leary, Eileen O’Leary Sullivan, and Susan O’Leary Mulhern — developed this project. The construction of the building was completed in January 2019. The Hampshire County Probate and Family Court has leased 22,000 square feet in the new building consisting of the entire first floor along with a portion of the second floor. Cooley Dickinson Health Care Corp. has also leased 7,682 square feet on the second floor for medical offices, and construction for that space is currently underway. Development Associates of Agawam, the project manager and leasing agent for the project, has been developing commercial and industrial property throughout the Pioneer Valley for more than 35 years. AMHERST — In what could serve as a model for tackling one of the nation’s top public-health crises, a UMass Amherst epidemiology researcher is teaming up with two Western Mass. sheriff’s offices to design, implement, and study an opioid-treatment program for jail detainees in Franklin and Hampshire counties. Funded with a $1.5 million grant from the federal Substance Abuse and Mental Health Services Administration, the three-year project aims to deliver medications to some 500 detainees who agree to treatment, and connect them to follow-up care through a comprehensive community re-entry program after their release. Elizabeth Evans, assistant professor in the School of Public Health and Health Sciences and one of the grant recipients, will collect data from all the stakeholders to measure the project’s outcomes. “The idea is to distill the lessons learned into a playbook or guide that can be used in jails in Massachusetts and across the nation,” she said. “Evidence supports the use of medications to treat opioid-use disorder. This model signifies a willingness of the sheriffs to deliver care to reduce recidivism and to save people’s lives.” Evans will help Franklin County Sheriff Christopher Donelan, Assistant Superintendent Ed Hayes, and their staff expand and formalize the groundbreaking opioid treatment they began offering inmates in 2015 at the county jail in Greenfield. She also will work with Hampshire County Sheriff Patrick Cahillane, Assistant Superintendent Melinda Cady, and their staff to implement the same program in the Northampton jail. SPRINGFIELD — The Hampden County Bar Assoc. is now accepting applications for the John F. Moriarty Scholarship and the Colonel Archer B. Battista Veterans Scholarship. The John F. Moriarty Scholarship is available to any Hampden County resident who has been admitted to or is attending a certified law school for the 2019-20 academic year. Applicants must have been residents of Hampden County for at least five years. The deadline date for the John F. Moriarty Scholarship is May 31. The Colonel Archer B. Battista Veterans Scholarship is available to any veteran with an honorable discharge or a current member of the U.S. military who has been admitted to or is attending a certified law school in New England for the 2019-20 year. The deadline for the Colonel Archer B. Battista Veterans Scholarship is May 15. Both scholarships are based on merit and financial need. Applications and additional information are available by contacting Caitlin Glenn at the Hampden County Bar Assoc. at (413) 732-4660 or [email protected] or by visiting www.hcbar.org/about-us/scholarships/. SPRINGFIELD — The MassHire Hampden County Workforce Board will hold a press conference on Friday, April 5 to launch its 2019 YouthWorks summer-jobs campaign. The event will take place at 1 p.m. at the Reed Institute, located at 152 Notre Dame St., Westfield. The agency’s goal is to place up to 800 youth in summer jobs. Westfield Mayor Brian Sullivan will be joined by Springfield Mayor Domenic Sarno, Holyoke Mayor Alex Morse, and Chicopee Mayor Richard Kos to announce the summer youth-employment initiative. Also in attendance will be state Sen. James Welch and state Reps. Joseph Wagner, John Velis, Jose Tosado, Aaron Vega, Carlos Gonzalez, and Bud Williams. Each year, thousands of YouthWorks applications are received for a few hundred jobs. Employer participation is paramount to ensure a successful summer for youth between ages 14 and 21. Youth employed through the YouthWorks summer-jobs program will earn $12 per hour, work an average of 125 hours over six weeks, and receive 15 hours of training in workplace-readiness skills and workplace safety. Employers who are interested in hiring a youth, becoming a YouthWorks worksite, or donating money to help pay the wages for a youth to work should contact Kathryn Kirby, manager of Youth Employment and Workforce Programs, at (413) 755-1359. • March 28: Margarita Madness, 5:30-8:30 p.m., hosted by Insterskate 91 at Hampshire Mall. Presented by TommyCar Auto Group. Enjoy an evening of margaritas and vote for your favorite. There will also be dishes from participating restaurants and dozens of raffle prizes. Trumpy of the Valley’s Hits 94.3 will emcee the event. Cost: $30 in advance, $40 at the door. Buy tickets at www.amherstarea.com. Margarita tables are sold out. • March 20: Big Honkin’ Business After Hours at Marcotte Ford, 4:30 p.m. This event is a collaboration with the Greater Westfield and Greater Chicopee chambers, featuring food stations, beer and wine, marketing opportunities, door prizes, and more. Cost: $10 for members, $25 for non-members. May 1: May Arrive @ 5, 5-7 p.m., hosted by Emerson Way, Northampton. A networking event sponsored by Gove Law Office, Keiter Builders, and Kuhn Riddle Architects. Cost: $10 for members. May 14: Workshop: “Microsoft Word Tips,” 9-11 a.m., hosted by the Greater Northampton Chamber of Commerce, 99 Pleasant St., Northampton. Presented by Pioneer Training. This workshop contains a variety of quick tips and tricks in Microsoft Word that will save hours of time. Attendees will learn to add buttons to the Quick Access Toolbar; shortcuts for selecting words, sentences, and paragraphs; and how (and why) to display non-printing characters in a document. Practice using the Format Painter to copy formatting and fix problems with numbered and bulleted lists. Learn to create AutoCorrect entries to correct common typos, and AutoText entries and Quick Parts to easily enter frequently used text. Cost: $25 for members, $35 for non-members. 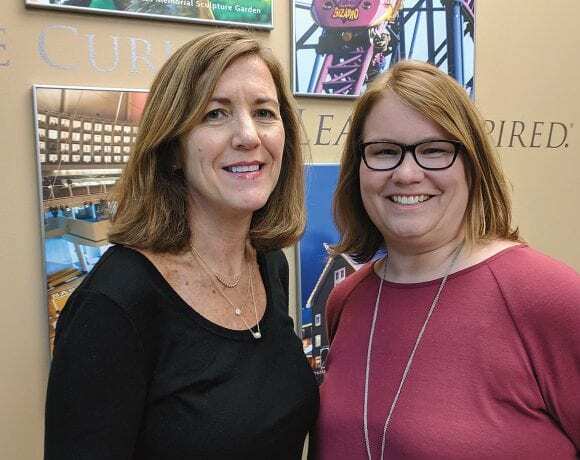 Mary Kay Wydra (left) and Alicia Szenda say the GSCVB works closely with area hotels as part of efforts to draw conventions and other events to Greater Springfield. There’s more than one way to look at a number. That’s especially true when it comes to hotel occupancy rates. Take Greater Springfield’s occupancy rates through the last six months of 2018. At almost 67%, they’re 5% higher than they were over the same period in 2017. That’s good news on its own, but especially positive when considering the capacity added over the past 18 months, from Holiday Inn Express on State Street in Springfield to Fairfield Inn & Suites in Holyoke; from Tru by Hilton in Chicopee to, of course, the hotel at MGM Springfield, the resort casino which is perhaps the region’s top tourism development in decades. 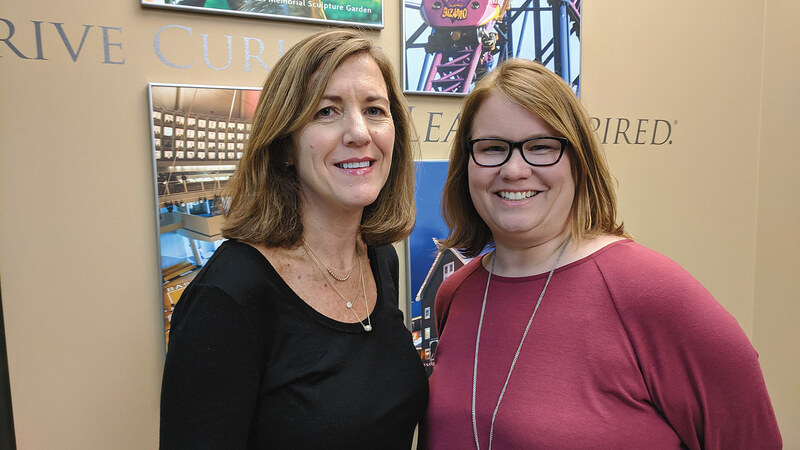 “We’ve definitely seen growth,” said Wydra, president of the Greater Springfield Convention & Visitors Bureau (GSCVB), adding that the average daily room rate also rose by $3 over that time frame. “The fact that we added inventory and we’re still able to grow rate and grow occupancy is a really good thing,” she noted. “In analyzing that, a lot of it is the MGM factor, and it’s conservative because MGM didn’t open until the end of August. We don’t even have a full year’s picture of them being fully operational, but in just those four months, it’s helped. But MGM is just one factor in drawing visitors to the region and increasing demand for hotel rooms. In fact, the relationship between hotels, tourist attractions, convention business, leisure travel, and a host of economic benefits that follow in wake of all that is the result of a coordinated dance between the various players — a dance that has continues to pick up the tempo. Greater Springfield still runs slightly below the national average in hotel occupancy rate — 63.6%, to be exact, compared to 66.2% nationally. And it doesn’t compare to a city like Boston, which hovers around 79% occupancy. The GSCVB has, indeed, seen an uptick in conventions in recent years, and believes MGM is just one more perk to draw in convention groups looking for a vibrant scene, which Western Mass. offers, especially during the summer. 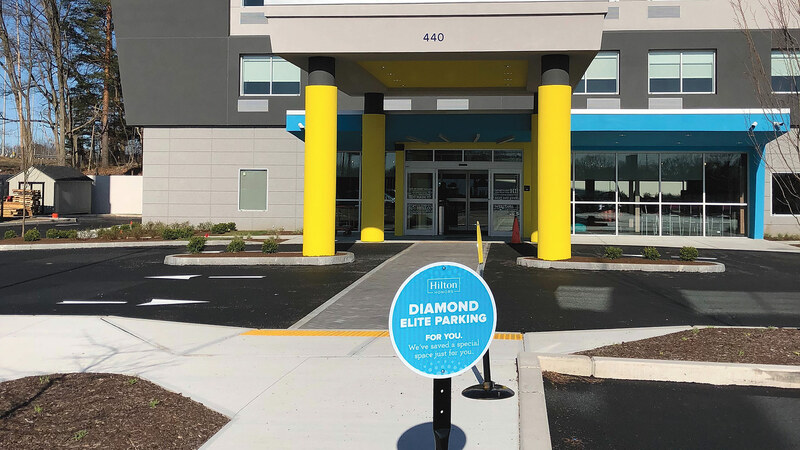 The new Tru by Hilton in Chicopee is one of several hotels that have recently opened in the region. “You’ll see that with some of the national conventions we work with,” said Alicia Szenda, director of Sales for the GSVCB. “We’ve hosted the National Square Dance Convention, the International Jugglers Association … those events take place in the summer, and people participate in them not for their job, but for their leisure activities, their hobbies, so they look forward to that week every summer, and that’s their family vacation. And a dynamic hotel scene is, indeed, a key element, which is Wydra is happy to see new names on the scene and planned renovations as well, such as Tower Square Hotel’s plan to return the Marriott name to its complex. As part of her role in recruiting conventions to the region and guiding them through the process (more on that later), Szenda also works directly with hotels, asking them to quote rates and block off a certain inventory of rooms, sometimes three years out. But there’s far more to the equation, Szenda noted. Then she gets to work finding the aforementioned local connections, setting up reasonably priced hotel options, and assembling tourism information about the region. Part of that is a hospitality program that many similar-sized cities don’t offer, she said, which includes everything from airport pickups and hotel greeters to downtown maps and goodie bags. And it’s not just repeat business from that convention group at stake, she added. Oftentimes family members tag along, extending the trip with some family time. It’s always interesting to see what impresses event planners, Wydra said. Once, Springfield was competing with a city in New Hampshire, and when the group heard that welcome signs would be hung downtown, it was a game changer. The planner had previously walked the streets of unfamiliar downtowns, getting permission as she went to tape up handmade signs. “She didn’t want to do that; she had a day job,” Wydra said. “The minute we take that out of their hands, make it easy, the results are often good for us. If Tower Square does bring back the Marriott name — and makes the upgrades required to do so — that will be another note of progress for the region’s expanding hotel scene, Wydra said. Greater Springfield is a brand of sorts, too, even though it can be a tough sell during the winter, which is why events like the recent AHL All-Star weekend are so desirable, driving room nights during a challenging time of the year for the hospitality industry. But there’s still plenty of room for hotels to flourish, Szenda said, as evidenced by the challenge of cobbling together enough rooms when multiple conventions and event planners want to swoop in during the same weekend — typically between spring and fall. But a rising tourism brand, buoyed most recently by MGM Springfield — and increased convention volume, much of which promises to become repeat business — is certainly changing the demand picture for the better. • March 12: 1Berkshire Education Session: “Digital Marketing for Community Organizations,” 3-5 p.m., hosted by Lee Bank, 40 Pittsfield Lenox Road, Lenox. Join 1Berkshire, HYFN Local, and WWLP Media as guest presenter Mitch West discusses digital advertising, incorporating video and social media. Free to 1Berkshire members. • March 12: 1Berkshire Chamber Nite, 5-7 p.m., hosted by Lee Bank, 40 Pittsfield Lenox Road, Lenox. Join us for the March Chamber Nite in partnership with the Nonprofit Center of the Berkshires. Members of either organization get in for free, and we’ll highlight the theme of community impact. • March 13: 1Berkshire Education Session: “Digital Marketing for Small, Medium, and Large Companies,” 8-11 a.m., hosted by 1Berkshire, 66 Allen St., Pittsfield. Join 1Berkshire, HYFN Local, and WWLP Media as guest presenter Mitch West discusses incorporating video into digital advertising strategies (8 a.m.), social media (9 a.m.), and navigating digital advertising (10 a.m.). Free to 1Berkshire members. • March 13: 1Berkshire Education Session: “Digital Marketing for Creative Economy, Culturals, Hospitality, and Tourism,” 2-4 p.m, hosted by Red Lion Inn, 30 Main St., Stockbridge. Join 1Berkshire, HYFN Local, and WWLP Media as guest presenter Mitch West discusses digital advertising, incorporating video and social media. Free to 1Berkshire members. • March 6: Business Leadership Discussion Group, 4:30-7:30 p.m., hosted by Jake’s at the Mill, Amherst. Presented by Family Planning Business Center and Amherst Area Chamber of Commerce. Register at www.amherstarea.com. • March 8: Big Honkin’ Business After Hours, 4:30-6:30 p.m., a multi-chamber event hosted by Marcotte Ford. A celebration of Marcotte’s new, state-of-the-art dealership. Cost: $10 for members, $15 for non-members. • March 13: Annual St. Patrick’s Day Breakfast, 7:15 a.m., hosted by the Log Cabin, Holyoke. Presented by PeoplesBank. Sponsored by the Republican; Holyoke Gas and Electric; Resnic, Beaureguard, Waite and Driscoll; Holyoke Medical Center; and Marcotte Ford. Join us for our annual St. Patrick’s weekend kickoff as we feature live Irish music, Holyoke tartan for sale, a full Irish breakfast, and plenty of laughs and connections. Rumor has it there will be a special guest speaker. As always, there will be plenty of Irish cheer. Cost: $35 for members, $50 for non-members, $250 for tables of eight for members. Shamrock sponsorship for $550 (e-mail [email protected]).